Sovcomflot (SCF Group) is Russia’s largest, and one of the world’s leading, shipping companies. They have a strong track record of developing shipping operations in the Arctic, drawing upon its significant expertise in Arctic shipping and its strong commitment to protection of the delicate Arctic ecosystem. They are closely associated with operational excellence in its shuttle tanker activities in the harsh environments of the Arctic and Subarctic seas. 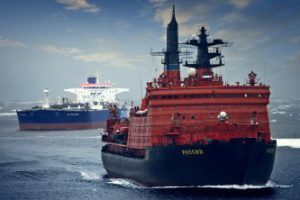 It has managed to gradually develop a fleet of high ice class vessels, with substantial winterization features, crewed by highly experienced seafarers, to support the transportation needs of the huge energy projects located in the North and Far East of Russia. There are 153 vessels in the company’s inventory, 12.74 mln. tonnes DWT (as of January 2015) and over 7,800 employees at sea and ashore. Sovcomflot is committed to innovation and the use of state-of-the-art technologies. Since 2005, the company has operated a fleet of three unique and highly sophisticated shuttle tankers serving the offshore ice-resistant offloading terminal at Varandey within the Polar Circle (Pechora Sea). Unrivalled in their class, they were specially constructed and equipped with DP systems for operations in extreme climatic conditions in areas characterized by very low temperatures and strong ice loads. In April 2014, Sovcomflot began transporting oil from the first offshore oil production project at Prirazlomnoye using another two 70,000 tonnes high ice-class shuttle tankers, each equipped with a DP system and suited to the heavy ice conditions of the Pechora Sea. Sovcomflot has been a leader in developing the Northern Sea Route (NSR) and believes it provides a commercially viable and environmentally safe shipping route. The commercial attractions will only increase as infrastructure and hydrocarbons projects are developed in the Arctic region. Long-term, only companies that provide high quality transport services to inter­national standards are likely to be successful in this region. The vessels Sovcomflot operates in Arctic waters comply with all the relevant safety and environmental requirements and this forms an integral part of the quality of the service the Group offers. In August 2010, the large tonnage Aframax tanker SCF Baltica with a deadweight of 117,000 tonnes, of Arc 5 ice class (ICE-1A Super), undertook a voyage from Murmansk to Ningbo (China). The voyage duration was 22 days, some eight and a half days of which were along the NSR. Compared to the alternative route through the Suez Canal, 18 days were saved.